Type A utilized the services of the My Twinn Company to create dolls based on our likeness. Since the company is geared towards children from three to twelve years old, their ability to twin us accurately was limited. After Type A submitted photographs and specific instructions to company representatives, the twins were constructed. While these dolls were created directly from our images, the resemblance is completely forced. The dolls exist as a means to an end, surrogates for role-playing. The resulting photographs carry forward issues addressed in previous work, but with greater flexibility and objectivity. 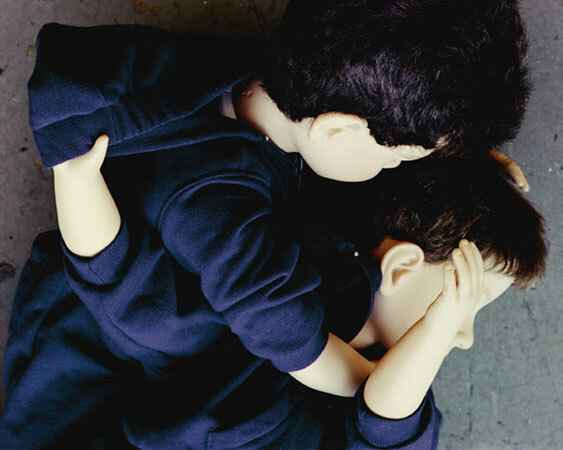 By playing with dolls, Type A can further address the physical competition, sexual tension, and one-upmanship initiated in childhood and continued through the present.